IERA is founded in January 2015 by Changyue Song and operated under the supervision of Professor Kaibo Liu and Professor Xi Zhang. IERA is a non-profit website and platform for introducing, spreading, and enhancing the knowledge of Industrial Engineering to people over the world. IERA also serves as a central hub to connect audiences of industrial scientists, academic researchers, engineers, students and those who are interested in IE to share ideas, knowledge, and experience. Industrial Engineering is a multi-discipline field, focusing on the improvement of efficiency, reduction of cost, and enhancement of humanity in human-involved systems. A variety of tools are employed such as operations research, simulation, and statistics. Nowadays, Industrial Engineering shows more and more power in the society such as manufacturing industry, service industry, and healthcare. At the same time, more and more companies and organizations realize the helpfulness of Industrial Engineering. We are expecting the coming era of Industrial Engineering. With this in mind, we try to act as a part of the impetus. We not only introduce popular and useful theories and techniques in this field, but also concern their applications in real industry. We hope this website will be an information source for industrial scientists, academic researchers, engineers, students in the IE society. By acting as a platform, we try to make contributions to the development of this subject. The website includes the main site and the forums. In the main site, we publish IE-related articles regularly. All the articles are original or authorized by the author(s). The content of the articles may be various, ranging from sharing a new idea to introducing an existing application. Our editors will try their best to ensure the quality of these articles. We hope every user, no matter scientists, engineers, or students, can benefit from some of the articles and promote our IE field to a broader scale. In the forums, every visitor can view the discussions and questions from previous post. Every registered user can raise and answer questions to contribute to our IE society. 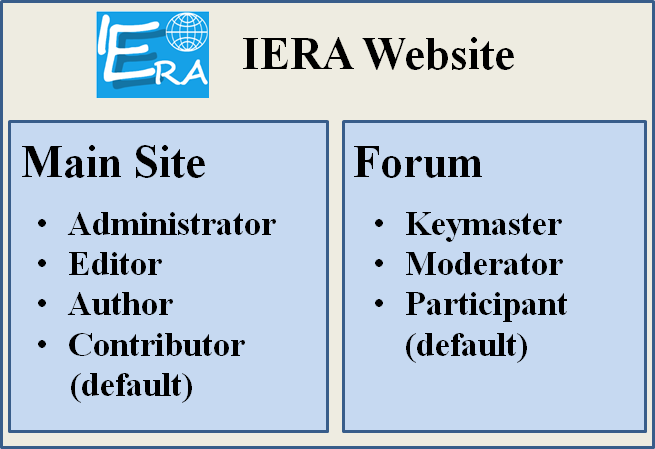 For more information about website structure and website features, please visit http://iera.name/iera-update-150310/. Please contact us at admin@iera.name if you have any question or would like to contribute to the web forum for our IE society. We are grateful if you find our articles or other content helpful and recommend to others. However, please respect the efforts of our authors and editors, and do NOT copy the entire article to another unauthorized website. You may just give the link and abstract when recommend an article to others. Article authors preserve the copyright of their own articles, and IERA preserve the copyright of all other content of the entire website. We will try our best to check the articles, pages, comments, topics, and replies in our main site and forums and fight against right infringement. However, due to uncontrollable factor, we cannot guarantee that infringement of a third party’s right does not or will not happen. IERA takes no responsibility for any right infringement, and the website users who post the infringing message are fully responsible for legal liabilities. If you feel your interests are violated, please contact us at admin@iera.name immediately.